More a matter of feeling than of painting in sounds. As much as Beethoven tried to deny that the Sixth Symphony was program music (i.e., music depicting a specific scene or events), a genre he detested, it seems that he protested too much. He gives the game away in his movement titles such as "Cheerful impressions awakened upon arrival into the country," "Scene by the Brook," "Thunder storm- Tempest" and the like. The symphony clearly depicts more than just a mood, but in performance often the sense of mood is lost in favor of the attempt to make a depiction of a pastoral scene. Not so here on the last of Sony Classical's DVDs of Beethoven's symphonies. Von Karajan gives emphasis to the moods inherent in the programmatic titles to the movements, such as the "cheerful impressions upon arrival in the country." The cheerful mood is well conveyed, most effectively in the first movement, where the second development is briefly given an ever so quickened pulse. The listener can hardly help but share the joy. 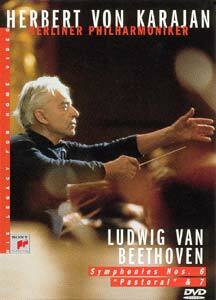 Although von Karajan recorded the entire Beethoven symphony cycle at least four times over a period of thirty-some years, it is notable that his tempi very rarely varied; an early 1960's performance of a Beethoven symphony would be at almost exactly the same speed as it would in the 1980's. Many of his recordings vary by as little as a few seconds per movement, even when separated by decades. This makes the recording of the second movement of the Sixth, the Scene by the Brook particularly notable, for it is as if von Karajan completely rethought his interpretation of this movement. Here he takes it at a far greater speed than his other recordings, or indeed, of any other interpretation I've ever heard. He cuts well over a minute off the running time as compared to his 1963 recording of the movement. Upon listening to this disc, I'm convinced that his reinterpretation was correct: this movement, which ordinarily is one of my least favorite Beethoven compositions and downright boring, is given a new life at this quicker tempo, and better conveys the sense of water flowing and changing kaleidoscopically. Nothing of the pastoral sense is lost by this greater speed. The final three movements are likewise solid. During the "storm" episode of the fourth movement, the timpani flirts with being too forward, but pulls back just before reaching that point. The horn transition from the fourth to the fifth movement in particular is splendid. In this last movement, the musicians get into the swing of things as I've not seen them do anywhere else in this series, visibly swaying from side to side in exuberance and pleasure. The Seventh Symphony is, by contrast to the pastoral Sixth, a veritable bacchanal of sound. The blaring initial chord of the first movement announces that we are in for a loud and raucous time, and the Berlin Philharmonic delivers nicely. Every movement has its own driving beat: the second with its stately march and the others with their riotous dance rhythms. Von Karajan respects this character, and delivers the rhythms in spades. The pulse carries through the performance wonderfully at every moment. In particular, the second movement, one of my all time favorites, moves in a magnificent manner in the strings, punctuated both on and off the beat by bold and brassy winds. My one quibble is that in the Sixth symphony von Karajan disregards every single repeat to be found in the score. While the symphony can be a bit long when the second movement is taken at its usual dreary speed, at this quicker tempo the balance of the whole could easily stand the repeats of the first sections of both the first and third movements. He does take the repeats in the Seventh Symphony, to my great pleasure. Image Transfer Review: As always, the color range is intentionally muted. Colors do appear lifelike, and shadow detail is quite nice. Interestingly, during the Pastoral, von Karajan's face is shot in shadow much of the time; however, no detail is lost and the picture is still clear. The bit rate for the video is a little lower than in other volumes, around 6 Mbps much of the time. The camera work, as always is very good indeed, giving visual flair and variety to mesh with the music, emphasizing the musicians playing prominent parts at the moment. Audio Transfer Review: The DD 4.0 track is slightly more clear than the PCM track, although in this case there is not a huge difference. The surround mix is very involving, with the listener feeling as if he is amongst the orchestra itself. The directionality is not pronounced, but is constantly present nonetheless in fairly subtle ways. One can switch back and forth between audio tracks via remote without having to fool with the menus. One area in which this interpretation particularly excels is the lengthy crescendos which Beethoven writes. The greater range of DVD audio is used to good effect here, for just as one thinks that the peak of the crescendo has been reached, it can't go any farther, von Karajan does indeed bring it farther, and then farther still. At the same time, the lower end of the scale is well utilized. Notably, in the third movement of the Sixth Symphony the distinction between p and pp is clearly audible, whereas in many recordings it is lost. The sound is highly pleasing throughout, and the bass, even without an LFE channel is quite satisfactory. Extras Review: We receive the same bio of von Karajan which was on the other entries in this series, as well as about six screens of notes on the symphonies. Both are provided in English, French and Spanish. This area is a little lacking for works of such towering importance. A great deal more could have been done here. Sony brings its series of Beethoven symphonies to a rousing conclusion here. First-rate interpretations combined with stellar audio make this one a must-buy for classical music fans. The only thing lacking is the extras.